town. Quirky and far from ordinary, it's the kind of place where you check your worries at the city limits sign, trade in suits for something bit more casual and prepare for experiences you'll find only in Austin. Music floods the city everyday whether it be from our own City Hall, a local coffee shop, an outdoor park, or one of the best music venues in Texas! With a city full of so much culture there is music for everyone's taste. 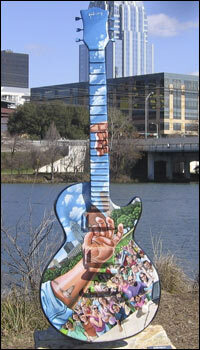 is Austin, Texas' largest outdoor music festival. Over these three days there will be over 130 band performing over 8 stages. Some of the bands include Bob Dylan and his Band, Bjork, The White Stripes, The Killers, Robert Earl Keen, My Morning Jacket, Arcade Fire, Joss Stone, and several more amazingly talented bands! March 8-18th, 2012 By day, the music industry's most accomplished and creative personalities collaborated, argued, and shared their experiences in dozens of panels, workshops, interviews, and meetings. Over 1400 acts showcased last year before more than 8000 registrants from all over the world. Pop, jazz, country, blues, reggae, hip hop, electronica - every imaginable style of music, from nearly every continent - is represented each night at over 50 of Austin's premier stages, many within walking distance of one another. There's more amazing music performed and crucial business conducted in Austin over those few days than anyone who hasn't been to SXSW can imagine. If you have been, you'll want to come back, if you haven't, now is your chance. Make South by Southwest part of your plans this year. is a 501(c)(3) non-profit, all-volunteer, membership-supported and -operated organization dedicated to encouraging the performance, appreciation, preservation, and sharing of all genres of traditional / folk / ethnic / international music and dance. From Old-Time, Celtic, Bluegrass, and traditional Jazz to Latin American, Zydeco, Cajun, and Gospel, AFTM has provided the Austin community with a sampling of musical and dance expressions from folk cultures the world over. for the performing arts is a world class venue for ballets, plays, and musical performances showcasing local artists talents excellence and commitment to culture. has everything that you need, it is a Barbecue restaurant with live music. Includes menu, music schedule, history, and ordering information for barbecue sauce and rubs. 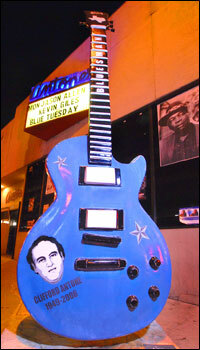 has its own flavor of Blues. Antone's is THE blues club in Austin, and probably in Texas. Artists such as Stevie Ray Vaughan, Marcia Ball, and W.C. Clark play or have played there on a fairly regular basis. is located in the heart of the Texas Hill Country in a natural, open-air setting enveloped in the shade of 400 year old live oaks. Multi tiered decks, fish ponds and plaza areas illuminate the magic of the amphitheater’s atmosphere. This one of a kind amphitheater hosts music as varied and eclectic as the people of Austin. Willie Nelson, David Bowie, Natalie Merchant, the Gypsy Kings, Lyle Lovett, The Neville Brothers, Sheryl Crow, Widespread Panic and Norah Jones have all graced the tree surrounded stage. is Austin's premier concert and special events facility. The building's art-deco interior creates a first class atmosphere for over 3,000 people. Recent events include Willie Nelson, Switchfoot, Velvet Revolver, and several large corporate events. is a great source of information for all of your Austin, Texas needs. They have concerts categorized by date, venue, or category. You can also find restaurants and ratings, movies, real estate, and calendar of events.